I’ve never met Art, a salesperson at M.L. Leddy’s, one of the better boot makers in Texas. 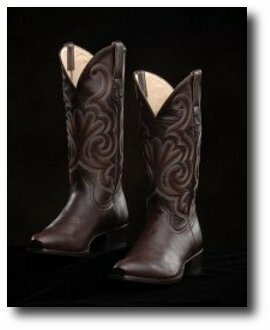 I simply inquired about ordering my second pair from their affordable Vaquero line. Art took the call. We did an exchange. The new boots are just right. Footwear, of course, isn’t the issue here. The issue is customer service. Art knew that his number one job wasn’t to push product, but to retain a loyal customer. To do that, Art had to connect with me, a total stranger, and to imagine what I needed. He had to put my interests ahead of Leddy’s margin. Making that intuitive leap — imagining the other’s need — happens too rarely. We project our own needs onto others. We decide what we want to do, and try to convince others to go along. We extol our institutions when they please us, without asking whether they serve others. We pay executives what they want to earn, not what will benefit the entire enterprise and its marketplace. Churches do endless inward-looking opinion surveys, but lose touch with emerging needs outside. What we get is a culture devoted to self, marked more by fickleness than loyalty, in which people are encouraged to take rather than give, look inward rather than outward, and to exploit others rather than connect with them. My new friend Art showed a better way. He still made the sale, and now he will make another one. I am already looking for an excuse to visit Fort Worth.